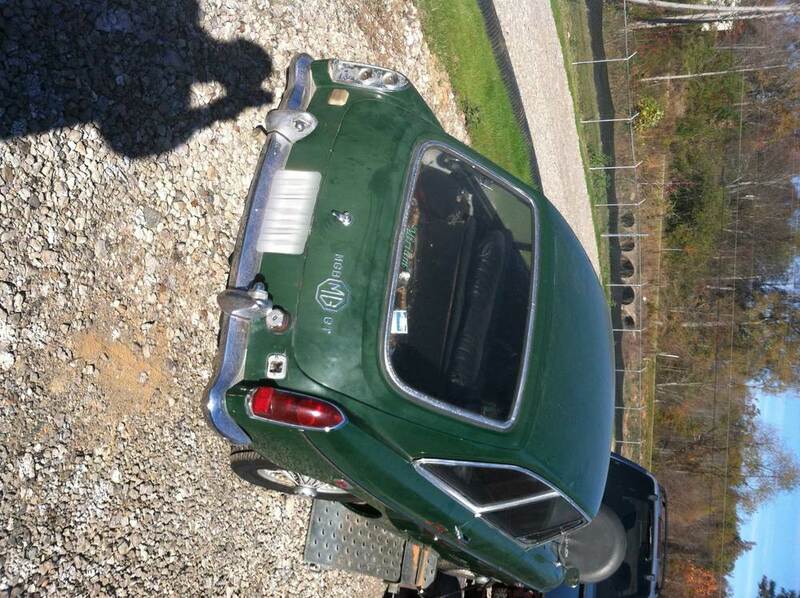 In 1988, we were living in Alabama when I noticed a 1969 MGB GT for sale in the Tuscaloosa News. When I went to look at the car, it was sitting in a carport, sadly well past its prime. However, it had some good points, the seller was the original owner, had driven the car to college. It ran and drove (to an extent). On the minus side, it had been painted silver (now cracked and faded) over its original British Racing Green and had some rust in the rockers. A deal was made for $1000 and I became the second owner, and it became my second MG.
My wife and I ran an auto trim/striping business then, so I was able to get some replacement seat covers through a vendor we used, and bargained with a local body man to paint the car. I did all the body work and sanding, he painted it in his employer’s new down-draft paint booth (after hours). I in turn striped and lettered his 1966 Nova drag car. 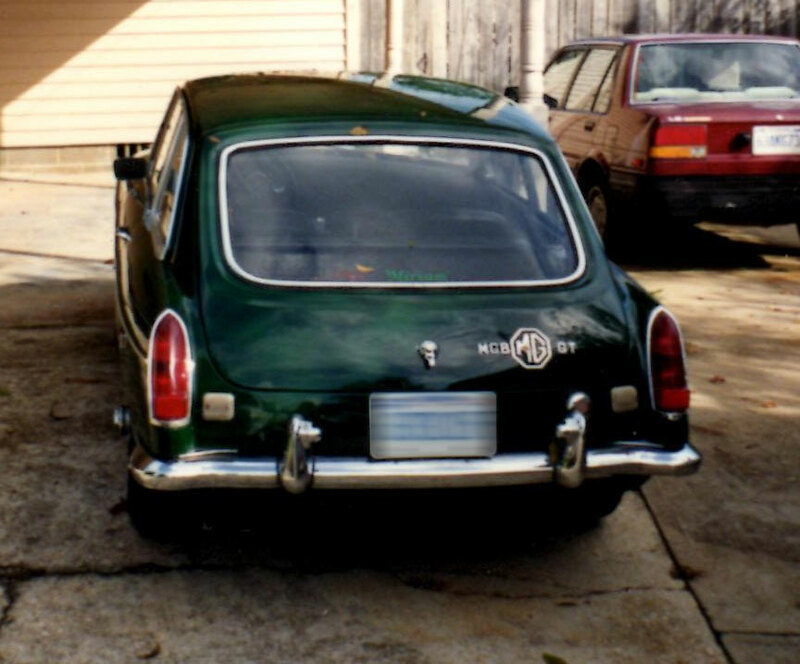 When the car was back on the road, we christened it with the name ‘Miriam,’ putting a green decal of her name on the back glass. In mid-1993 I sold Miriam. The ad said the car was in Tuscaloosa, and there in one of the photos you could see ‘Miriam’ on the back glass. I couldn’t believe it! I called my wife and she said, “Contact them, see if you can buy it.” (What a girl!) There was no phone number or price in the ad; it just said: sale or trade. I send an email and got a reply back a few hours later that he wanted $850, someone was offering to trade hunting equipment and if that didn’t work out he would let me know. Initially, I did not mention that I used to own the car or that I was not local to the car, but when I received that reply, I decided to play all my cards. I wrote back stating that I was in Georgia, used to own the car and would give him $1000 if he would hold it for me until that weekend and that, by the way, this was no joke. It turned out that when he saw my reply and my name, he knew it was no joke, as there were some papers in the car with my name on them. That Saturday a friend and I rented a tow dolly and made the drive to Tuscaloosa, which was also a college football home game day, so loads of traffic in town. Miriam is at home again and has now had a full restoration back to how she looked in 1969.